Poster Commander is a less expensive and “green” alternative to poster handouts, and allows a researcher to transmit an electronic file (PDF) of the poster from his or her iPhone to the iPhones of attendees who also have this app. Poster files are transferred using the iPhone’s Bluetooth capabilities. Through the “Statistics” screen, poster presenters can keep track of how many times each poster is downloaded. Once a poster is downloaded, Poster Commander has an integrated viewer that can magnify it for reading on the iPhone. Alternatively, the poster can be transferred to a computer or laptop for viewing or printing. Poster “Senders” (presenters) and “Receivers” (attendees) have the option of identifying themselves to each other through Poster Commander, and providing email addresses that can be automatically dropped into Contacts. So, if you are presenting a poster, you can let attendees who download your poster know you are open to receiving emailed questions about your study. If you are collecting posters, you can let the presenters know you would like to receive additional information. For example, the presenter can later email you regarding when and where the data will be published as a full article. 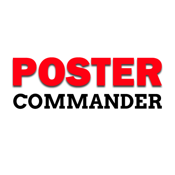 As with all iPhone apps, Poster Commander will work on the iPad, but it is not specifically sized for that platform.